This recipe is quick; taking about 20 minutes to make, start to finish. It's flexible too...if you like yours a little more spicy, use one can of hot, and one can of mild diced tomatoes and green chilies. If you like it less spicy, use one can mild diced tomatoes and green chilies, and one can plain diced tomatoes. Either way, it's great for a fast weeknight meal. 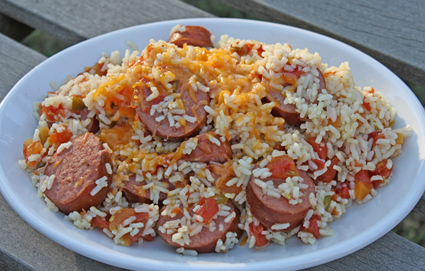 Mix tomatoes, water, smoked sausage, and bouillon in a large skillet. Bring to a boil. Reduce heat to medium-low; simmer 1 to 2 minutes or until the bouillon is dissolved. Stir in instant rice; cover. Cook on low heat 5 minutes. Stir. Sprinkle cheese on top. Serve. Baking Bread- Is it done yet?